Successfully Added Mebook Touch - 7 Inch High Resolution Touchscreen eBook Reader + Super Media Player (4GB) to your Shopping Cart. A powerful ebook reader that reads all the most popular ebook formats. Just like The Amazon Kindle. A super media player that plays the Internet's most widely downloaded audio and video formats. Just like The iPod Touch. Brought together in a stylish body that's simply attractive and attractively simple to use. 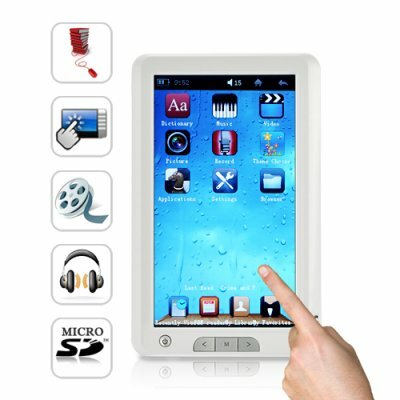 Introducing The Mebook Touch 7 Inch High Resolution Touchscreen eBook Reader + Super Media Player - prepare to be amazed! Like a Kindle: The first thing you'll notice when you pick up The Mebook Touch is that it feels really natural to hold. So comfortable...perfect when you're on a long flight, perfect when you're in bed, perfect at lunch...The Mebook Touch in one hand and a roast beef and swiss on dark rye with a smidgen of mustard in the other hand. Ahhh happiness! In fact The Mebook Touch will soon be your new best friend what with its ability to flawlessly play TXT, PDF, EPUB, CHM, HTML, PDB and UMD ebook format files which means you'll never be at a loss for something interesting to read. In fact, look at the FAQ's below for some suggestions on where to find interesting reading gems. Like an iPod Touch: But life would be boring indeed if entertainment consisted of text alone. The Mebook Touch has you covered there with its over the top ability to play the best audio and video formats including MP3, APE, WMA, WMV and FLAC (yes that's right, this monster plays FLAC files!) as well as MPEG, DAT, VOB, RMVB, AVI (H.624, DIVX , XVID), PMP and MKV (yes that's right, this monster plays MKV files!) And it does so in 720p video glory!). Even the iPod Touch...can't Touch this! But so much better than both... Such rewarding functionality packaged in a slim body that is light and sturdy with a 7 inch high definition touchscreen along with 4GB of internal memory and a TF micro SD card slot for further memory expansion along with a heavy duty 2000 mAh battery all leads to one simple conclusion - The Mebook Touch is sure to be your favorite electronic gadget for many years to come! Brought to you by the leader in cutting edge electronics - Chinavasion. Where can I get free e-Books from? For free e-Books, copy & paste the following link into a new URL address bar on your PC. [http://blog.chinavasion.com/index.php/2623/how-to-get-completely-free-ebooks-we-review-7-free-ebook-sites/]. I have a standard e-book, but this touch screen is just so far advanced, I want to read books again. It is great quality at a great price. Even including postage, I have no hope of buying an ebook reader here for anything like this price. Another excellent product from ChinaVasion keeping me happy.